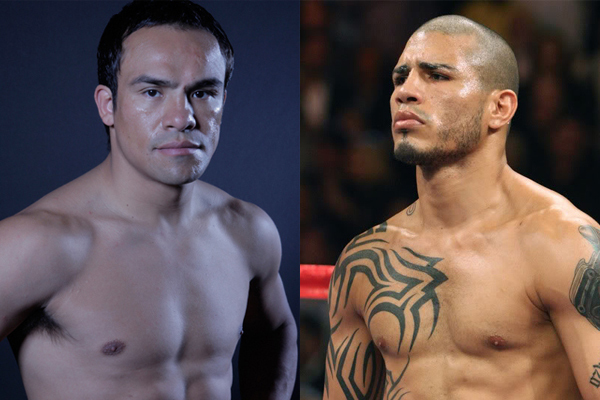 Juan Manuel Marquez vs. Miguel Cotto? Briggs Seekins October 24, 2016 Boxing, Headlines No Comments on Juan Manuel Marquez vs. Miguel Cotto? In recent weeks, there has been a lot of chatter online about a potential fight between Juan Manuel Marquez and Miguel Cotto. While this fight would have no importance to any world-title picture, it is impossible not to be intrigued by the possibility. Both men are future Hall of Famers and legendary members of proud national boxing traditions. Cotto is the only four-division world champion ever from Mexico. Marquez is clearly one of the three best fighters ever from Mexico. Marquez is now 43 and has not fought since defeating Mike Alvarado in May 2014. If anybody could come back and still look great in a boxing ring under such circumstances, it is Marquez. Throughout his career, he has been one of the sport’s best conditioned fighters. His style is a heady mix of precise footwork and daring counter punching, which has allowed him to age like fine wine. His greatest career moment came at 39, when he knocked out long-time rival Manny Pacquiao. Cotto has often looked like a faded version of himself since losing by Round 11 TKO to Antonio Margarito in 2008. There is good reason to believe Margarito was pounding at Cotto with loaded hand wraps during that bout. Cotto lost another brutal stoppage to Pacquiao in November 2009. Still, Cotto has had big moments in the years since, and remained a major boxing star. He won a world title at 154 pounds in 2010 and earned revenge against Margarito in 2011. After losing to up-and-comer Austin Trout in December 2012, he managed to hang around and defeated an even more-badly faded Sergio Martinez for the lineal middleweight title in June 2014. Cotto lost that title to Saul Alvarez in November 2015 and has yet to fight this year. A legacy fight against somebody like Marquez makes a lot of sense for him. The sticking point for this bout to take place will be agreeing upon a weight. Although he won a world title at welterweight, Marquez has never come into the ring higher than 144 pounds. He was arguably at his best fighting at between 126-135 pounds. Cotto was a world champion at 140 and 147 pounds, but has not weighed less than 152 pounds for a fight since his loss to Pacquiao. At 35, a cut to 147 or even 148 pounds would be a challenge for him, and would take a heavy toll on his body.